"I wanted to create a space in which to display artworks somewhat outside of this issue of subjectivity." My secondary school didn't really encourage Fine Art, or any creative subjects for that matter. I remember spending most of my A levels focusing on meticulous paintings instead of the ‘proper subjects’, Maths, Physics, Psychology etc…. I found my way onto the Bath Art Foundation course 4 years ago after attending a summer school at Slade. Finally I was in a space where the people around me shared similar views and ideas. The programme at Bath forced long hours in the studio, which developed a work ethic I still rely on today. 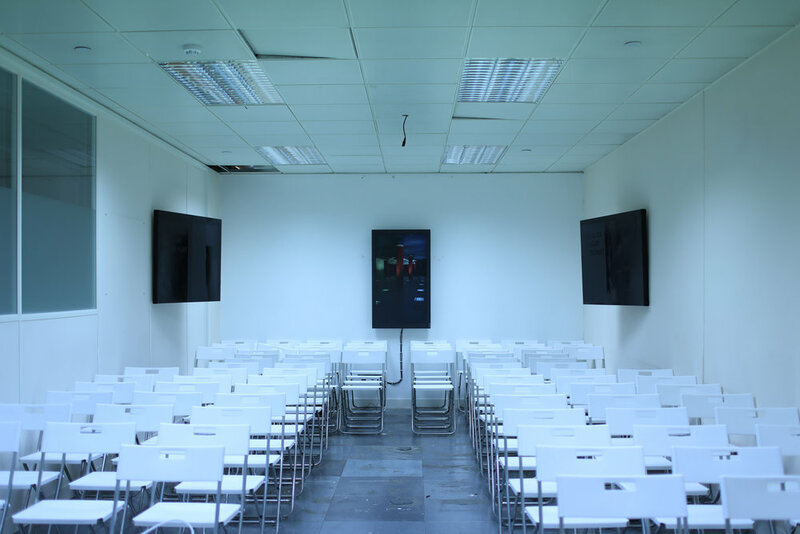 The Fine Art BA at Chelsea really encouraged and accommodated a peer learning environment. From day one the program had students organise off site exhibitions. My practice really benefited from the open environment and approach to making Chelsea had to offer (prior to Chelsea I would produce paintings in total privacy). Over the three years sharing the studios and being in the space all the time I developed strong relationships with many of my peers. It was always the same few of us who would get kicked out at 9pm every night. My theory tutor Paul O’Kane encouraged extensive research and I still consider my dissertation one of my strongest works. It really helped me to bring into focus the concepts behind my work, and I think I’ve produced much stronger paintings since. I now have a sense of clarity heavily informed by ongoing research which has become paramount to my artistic practice. Since graduating I have moved into a studio in Bermondsey which I share with 4 other artists. I share very close professional and personal relationships with all of them. 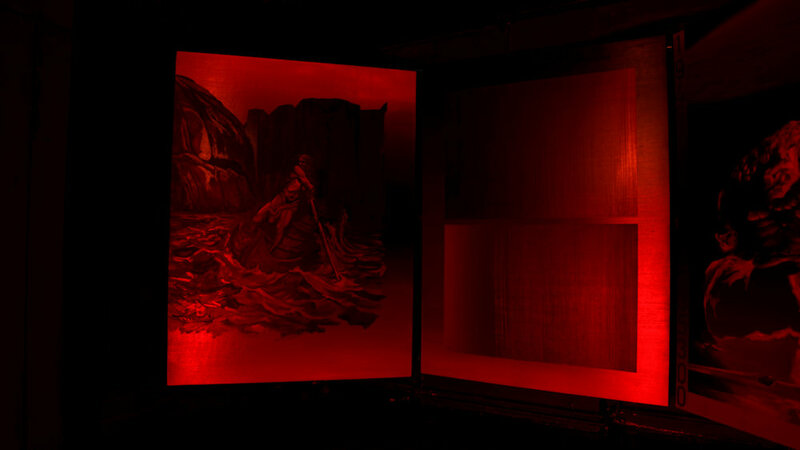 One of your more recent works was an installation called "Kingdom 5", could you tell us about this project and your thoughts behind it? Prior to Kingdom 5 I found myself at odds with my rather conventional and limited experience of the paintings I had been producing. Ben Fitton, a tutor at Chelsea who I really respected, brought to my attention that no matter what the content of my painting and what I intended to communicate, the viewer would always experience the work with their own subjective reading of the piece and would often interpret the work entirely different from how I had intended. 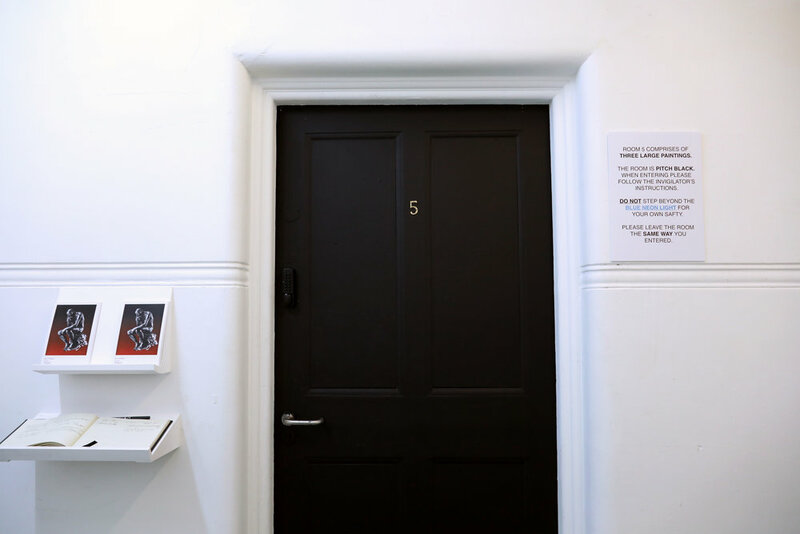 At a similar time, I learned about the distracting quality of whatever else surrounds the artwork, including other artworks placed nearby, the colour of the walls, the gallery space, the extension lead attached to a video work etc. These realisations frustrated me, so my new aim became to create an entire experience, controlling the space in which the paintings were placed. I was approaching the end of my degree and had gained the resources and drive to really challenge what I understood before to be the limitations of my own painting practice. For Kingdom 5 I demanded an entire room and I really made the most of it, dictating it’s smell, the fear and uncertainty of its darkness, the unnerving sound omitted by the heater, and the light it gave out guiding the spectators gaze. 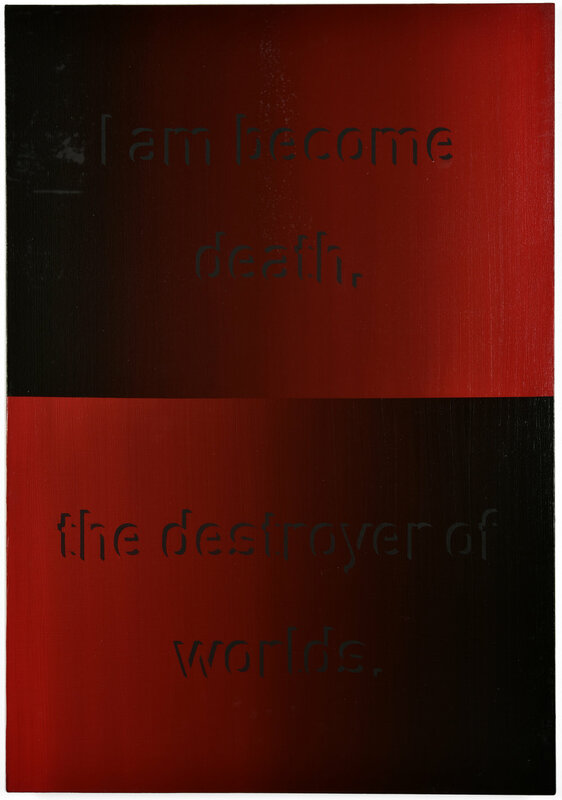 Start, middle and end, the paintings portray the irreversible transition between the life world and the death world as defined by Edmund Husserl in ‘The Crisis of European Sciences and Transcendental Phenomenology’. 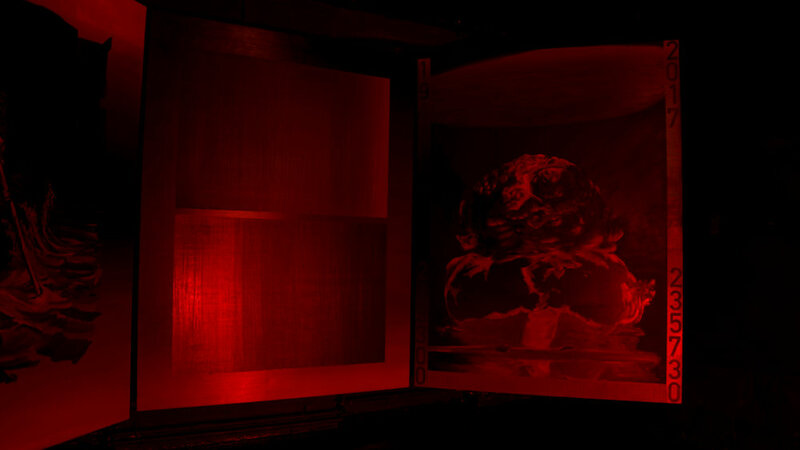 Kingdoms 5 now only exists as the experience of a single spectator during the short time the piece was on display. Despite the work lacking longevity, many people got to experience the piece and I still receive emails about the lasting effects left on the spectator. ‘Got way too scared & left. Darkness tried to stop me. What is this sorcery?’ anonymous response regarding Kingdom 5. There are certainly individual works which resonate with me but the largest influence I have found has come from the works of artists who operate outside of the norm or what is considered socially acceptable. James Turrell, Rudolf Stingel, James Capper, and Jordan Wolfson have been of paramount importance to my development during my early stages however it was artists like the Chapman Brothers, Frances Bacon and Auguste Rodin which changed the the way I perceived my own art making. I remember when I was younger reading a small exert from one of the Chapman brothers in a catalogue which said; ”Health warning: The contents of this exhibition may cause shock, vomiting, confusion, panic, euphoria and anxiety. If you suffer from high blood pressure, a nervous disorder or palpitations you should consult your doctor before viewing this exhibition.”. I was fascinated to see artists operating within their own territory for the first time. I found little interest in many of my peers desire to make ‘abstract paintings’ and was now starting to unearth practices where the intention wasn't always to make the world a happier place. This summer I visited Paris and had the opportunity to spend a great deal of time in the Rodin sculpture park. What blew me away was the incredible grief and anguish present in many of the sculptures on display. I considered ‘Ugolino And His Children’ to be the climax of my experience that day. Its caption read “…The hunger crazed count Ugolino devours his dead children, sentencing himself to eternal damnation…” Inadvertently I find myself most affected by my obsession with nuclear, and the tension between the USA and North Korea. The Dooms Day Clock is now the closest its been to midnight since the Cold War and recently has become a disturbing undertone affecting my creative discourse. 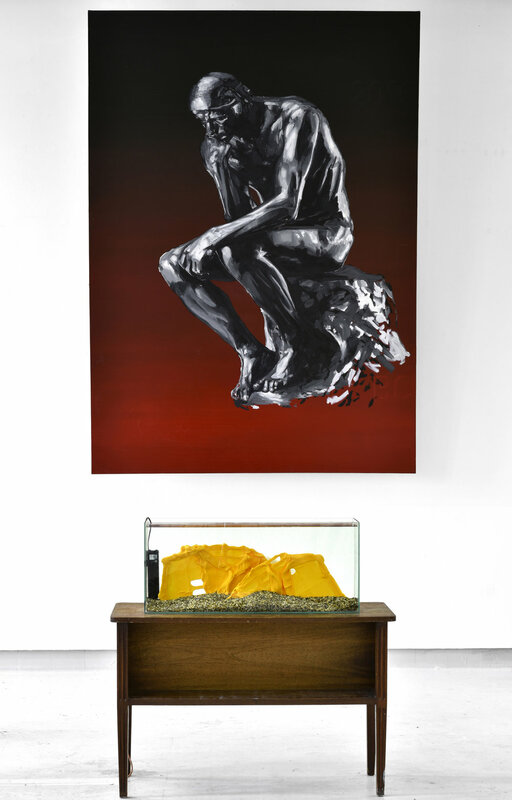 You have created a series of works called "Think Tank", where you display fish tanks with objects within them. Could you talk a bit about these works? Were any fish harmed? Upon inception of the project Think Tank I prepared a statement which reads as follows: “Think Tank deals with both art spaces and the subjective viewer. We, as artists, have no control over how our work is received. I wanted to create a space in which to display artworks somewhat outside of this issue of subjectivity. I have begun using Think Tank as an alternative mode for displaying artworks. The only condition of the space, is the instruction that artists make work aimed at engaging with the fish inside of the tank, the spectators” Since the Project’s inception 8 months ago the piece has travelled across England and has welcomed multiple different artists. Many of the people at my university would complain about the lack of opportunity for young working class artists to exhibit in central London without paying extortionate rates to hire spaces for only a couple of days. Think Tank was my way of fighting this. As mentioned before I had a real difficulty coming to terms with subjectivity and wanted an environment in which my peers and I could exhibit in a more lighthearted space and really begin to unpick the notion of display and purpose of the work we make. I also grew up with large tropical aquariums in Bath and loved the idea of having a space with an entirely new set of constraints, so that is what Think Tank became. The fish are very happy, and have enjoyed views of both the Welsh countryside and O2 Arena in the past. This curatorial project is a release from my main practice and something I have benefited from very much. I am excited to see where the Think Tank will go next. I spent years frustrated at Chelsea queuing for the technicians to cut lengths of wood on a chop saw. When we moved into the studio my dad gave me one as a graduation present; I had grown up in his workshop, building from an early age. In the studio myself and my friend Tom built a 3x4m mezzanine with any decent wood going to waste at Chelsea over the three years I spent there. we still had enough to build a wood workshop in the front quarter of the studio which can all make use of. We spent a good month designing a really accommodating and spacious workspace for our diverse practices. Three days a week I work In Fitzrovia for a production company. This covers most of my overheads and also means I am fortunate enough to attend a few private views after work each week. The rest of the time I spend in the studio. One day I could be building something for the space or an exhibition, another, focusing on the few paintings I'm currently working on. Our setup is really dynamic. Each artist graduated from UAL and we share the same studio ethos. We benefit from conversations had in the studio and rely on the critical feedback gained from being comfortable with each other after the years we have spent sharing together. I have yet to decide. The titles of the works chosen to show on my website are from the last two years and have all come about fairly naturally. For my Degree show piece the door to my space had a large chrome 5 that I could not tamper with. 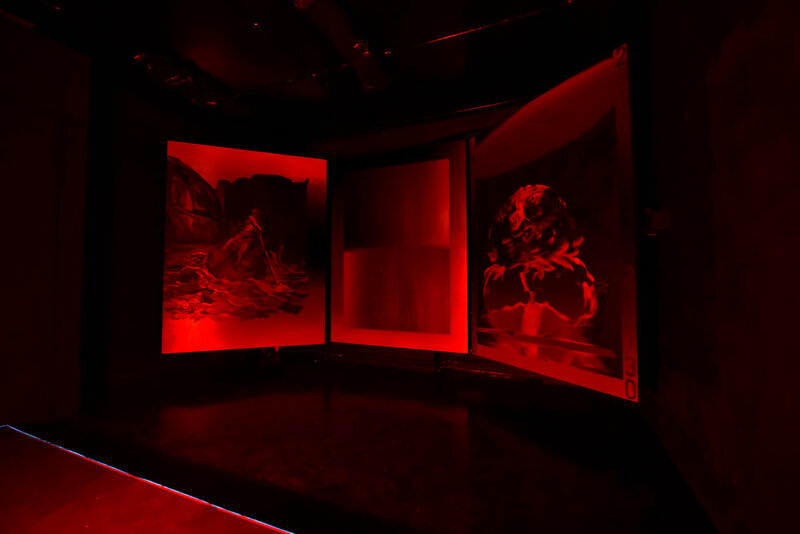 The painting series aimed to depict three different stages, the Natural, Technological and Nuclear my site specific piece needed a title that reflected not only the content of the room but also the space itself. Thinker and Eastern Waxing moon also came about instinctively, just because in many discussions regarding the large pieces I referred to the works as this. Between completing a work and the actual showing in an exhibition there is room for my indecisiveness to take over., after I have finished a painting it often sits with 3 or 4 other paintings and after a month or so only then might I have an accurate idea about how the piece should be named. The name is another opportunity outside of the surface of the work to elude (however subtlety) towards something else. I am really excited about my next series of paintings that will very much rely on the name to alter the viewers perception of the content. I am really excited for this next year. Despite meeting every criteria of the ‘struggling artist’ I have a wealth of other artists and creatives I get to work with every week. Six months ago I curated ‘Standby’ a show which welcomed 20 international artists and was a really big success. Since then I have exhibited a handful of times in the city and only recently closed ‘Megalopolis’ a really ambitious show curated with Mimi Hope, an artist I respect very much. I am looking forward to taking every opportunity which comes my way, both with my practice and the experience which comes with curating and exhibiting. I no longer feel constricted by the stagnant daily grind of art school routine. My practice now situates itself in a 24 hour access studio which I more than make the most of. Its a refreshing feeling no longer having to meet such strict and demanding health and safety requirements, no longer having to compromise an artwork for a deadline and no longer having to queue 20 minutes for the privilege of a technician cutting a mitre into timber with tools I have grown up using. Over the three years I spent at Chelsea I meticulously developed my experience and understanding of what artwork I intend to produce. I feel that I’ve finally reached the culmination of this preparation, and I’m looking forward to sharing whatever comes next.